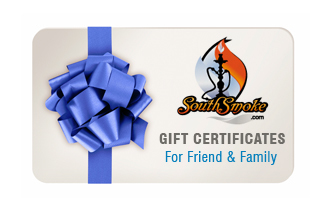 Give the perfect gift...a SouthSmoke.com Gift Card! Our Gift Cards are good toward any of our over 200 items. SouthSmoke.com Gift Cards are available for any amount between $10.00 and $200.00 and may be sent via email or by postal mail. So, go ahead and make someone happy today!
? Redeem your Gift Card into your SouthSmoke.com account. You'll be given this option during checkout, or you can redeem a gift certificate at any time by contacting the SouthSmoke.com Customer Service Center Toll Free at 888.57.SMOKE (888.577.6653). Once you redeem a certificate, you can apply any portion of your certificate to any order. Simply place the items you want in your virtual shopping basket, then continue to our secure checkout. After you login, please click on the shopping cart and enter the Gift Card code into the Discount Coupon box.
? The balance due on an order that exceeds the Gift Card amount must be paid by credit card or debit card.
? Any unused portion of the Gift Card will be held within your account.
? Gift Cards are non-transferable.
? Gift Cards may not be purchased or redeemed for international orders.
? Gift Cards may only be used for merchandise that is in stock at SouthSmoke.com.
? Gift Cards purchased through SouthSmoke.com do not have an expiration date.